Listening to: Hollie Smith E.P. Just got home from the Film Archive - went to see Nanook of the North, an Inuit "documentary" from 1922 with live music performance by Mike Cooper. As explained by Mike Cooper, it was not quite what we would consider a documentary. 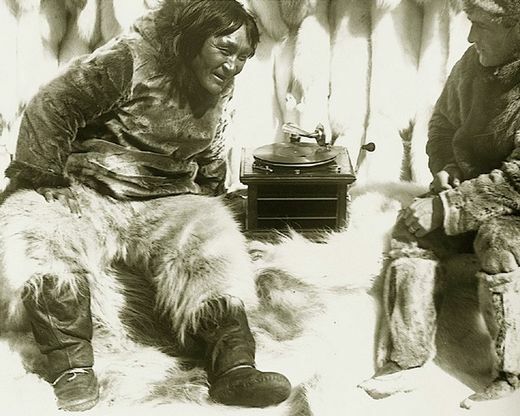 Surveyor and prospector Robert Flaherty came to live amongst the Inuit and was so taken with their way of life that he wanted to capture it on film. Along with normal day-to-day activities (hunting and building igloo), he had them re-enact many of their old customs that were no longer practiced. Mike's electronic accompaniment flowed alongside the iceflows with it's chilly organic pings, pops and drones. Real nice. Finished the night with a nice Thai dinner and now home with the rain on the roof. ...and don't you eat that yellow snow! ha! you tripped me out on your title. now i'll have to listen to zappa this weekend. i've grown up hearing the nanook name but never really bothered to find out about it. i always thought it was a serial like rin tin tin, but with an eskimo. pretty culturally shallow, eh? would you reccomend viewing on dvd? you don't have to talk me into the thai food, tho. Yep, Melvin, definitely recommended. Don't expect a narrative - there isn't one. I think it may have been a little dull with no sound - Mike Cooper's music was the perfect accompaniment. Maybe you could loop Yellow Snow... I think that could be a lot of fun. I used to have this weird extended mix of Yellow Snow as an MP3 - it was crazy and fantastic. I'll have to see if I still have a copy somewhere and send it on over. I knew my title would bring a Zappa fan out of the woodwork.